Rapper Kwaw Kese, who was arrested in December last year for smoking a substance suspected to be ganga, says he will allow the law to take its course on his issue because he is not above the law. Abodam, as he is affectionately called, was released from remand at the Kumasi Central Prison on Tuesday, December 30, 2014 after he was granted bail by a Kumasi Circuit Court. “Nobody is above the law; and currently, they are only alleging. It has not come out that what they are saying I was doing, I was really doing anything like that. To me, I think I’m not above the law so I will let the law take its course. I have never gone against the law and I will not go against the law. 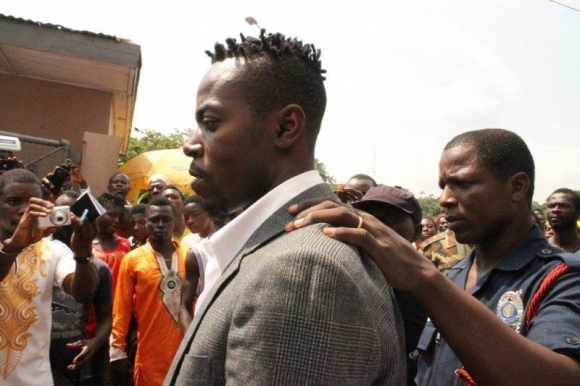 No one should go against the law because nobody is above the law,” Kwaw Kese stated on Peace FM’s Entertainment Review. The ‘King of the Street’, as he is popularly known, recounted that the first day he was sent to the prison, the inmates felt as though they had met Jesus and that the jubilation was similar to when Nelson Mandela was released from prison. “The first day I got into the cell, it was like the first day Mandela was released from prison. The jubilation was so much. All these prisoners were amazed. They were really happy to see me. You know, they knew I was coming so they prepared to meet the ‘King of the Street’. Some of the prisoners even told me that if I had not been brought to prison, they had no idea how they were going to meet me. When I got into the cells, the inmates felt like they had met Jesus,” the ‘Let Me Do My Thing’ singer said. According to him, most of the inmates kept praying for his release because they felt he did not deserve to be there. “Most of the inmates felt that I didn’t deserve to be in that place. Though I sometimes prayed for some of them to be released, they were always praying for my release,” he added. Kwaw Kese also admitted that in his estimation, he thought the whole issue was going to be over the day after his arrest but he was wrong. “When I was arrested initially, I thought maybe by the next day everything would have been over but the law didn’t allow that,” he disclosed.